Originally settled by the English and English Quakers from Chester County as early as 1730, and German immigrants from the York and Hanover areas in the late 1700's, much of the land now encompassed by Fairview Township was part of Pennsborough Township, Lancaster County. York County, when separated from Lancaster in 1749, had no definitely established northern boundary. In 1751, after the formation of Cumberland from Lancaster County, the Provincial Assembly passed a special Act making the Yellow Breeches Creek the official boundary between counties. At that time, the lands in this area were annexed to Newberry Township where they remained until February, 1803, when the York County Court approved petitions of area citizens to create the Township of Fairview. In the mid 1700's, the area known as New Market was owned by John Harris, founding father of Harrisburg and an Indian trader with the large Shawnee Indian settlement at the mouth of the Yellow Breeches Creek. By 1806, the area boasted several churches, stores, a working forge, and a distillery. The growth of this particular portion of the Township was due, in large part, to the establishment of a ferry across the Susquehanna and the York-Harrisburg Road, which passed through the area. In 1807, a 120-lot village was laid out, and lots were sold by lottery drawing held at the local tavern. The owner of the New Market Forge, Jacob Haldeman, Sr., who also had a working forge in Lisburn (thus, Forge Road), was responsible for laying out the town of New Cumberland in 1814, and selling the lots with the same lottery method used for New Market. Fairview Township began as an agricultural area, with only a small amount of industry and trade. Because of its primary agricultural base, Township population growth was very slow after the initial settlement. The first census count in 1820 was 1,764. Eighty years later, in 1900, the number reached 2,042-an increase of only 278. By 1950, it had more than doubled to 5,514, and the 1990 figures show the current Township population at 13,258. The development of better highway systems and the suburban growth of the Harrisburg area have greatly changed portions of the Township over the last 50 years. 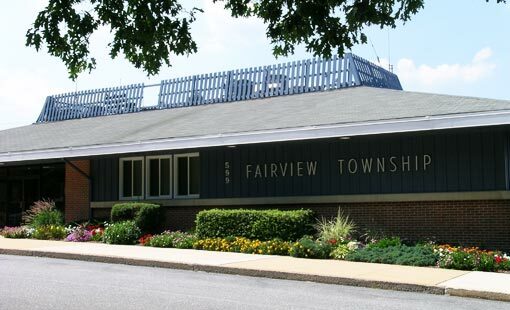 Although a significant part of Fairview is still agriculturally oriented, the spread of residential development and influx of commercial and industrial facilities continue to enhance career opportunities and the quality of life for the residents of Fairview Township.